Aah! Popsicles (or ice pops), provide a refreshing way to cool down on a hot, humid summer day! Whether you’re at home with your kids or teaching summer school, enjoy a little summery math, writing, and sweet, sticky fun with these activities. If you visit my blog often, you will discover I’m a strong proponent of teaching (practicing, reteaching, reviewing) anything and everything number sense. Ten frames are a wonderful tool for counting, subtilizing (quickly recognizing and naming how many objects without counting), and developing an understanding of the relationships between the numbers 1-20 and the important anchor numbers of 5, 10, and 20. 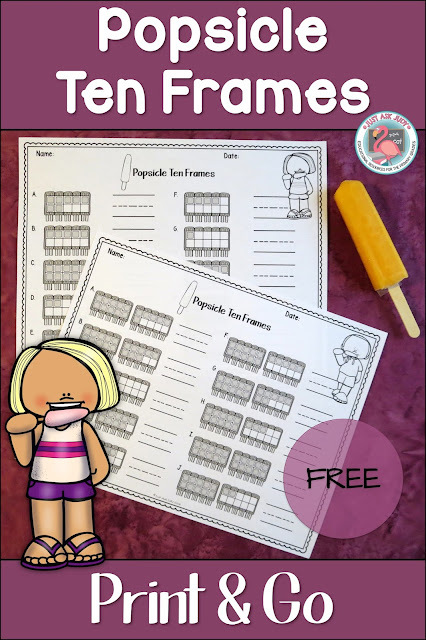 Here are two free popsicle themed ten frame worksheets for practice and review, one for the numbers 1-10 and another for 11-20. Knowledge of tally marks is important for representing data. It can take multiple exposures for some children to grasp the idea that tally marks are presented in groups of fives and ones. 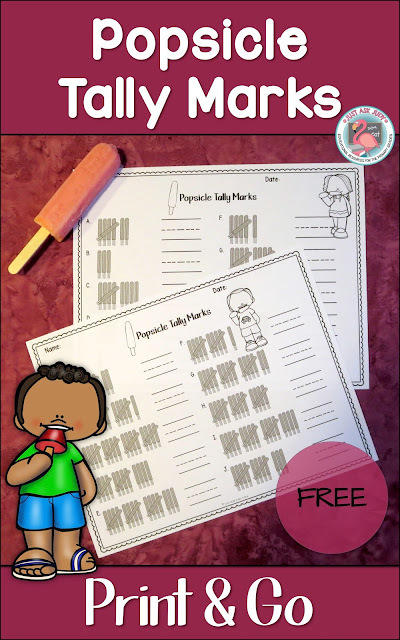 These two free popsicle tally mark worksheets, one for the numbers 1-10 and the other for 11-20, provide counting practice with tally marks. 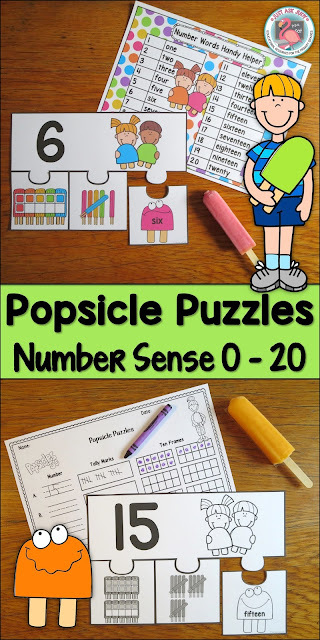 You might be interested in this number sense activity, Popsicle Puzzles 0-20, available in my TpT store. Of course, your kids need to savor actual frosty, sticky popsicles while they’re working! There are oodles of recipes online for making homemade popsicles or ice pops. What a fabulous summertime learning opportunity! You can easily incorporate math, vocabulary development, and procedural writing, all while having a blast. I chose this recipe, Greek Yogurt Berry Smoothie Pops from Mom On Timeout, for being kid friendly. It is fairly healthy and requires only three ingredients. There is no peeling or cutting to do as the fruit is frozen. 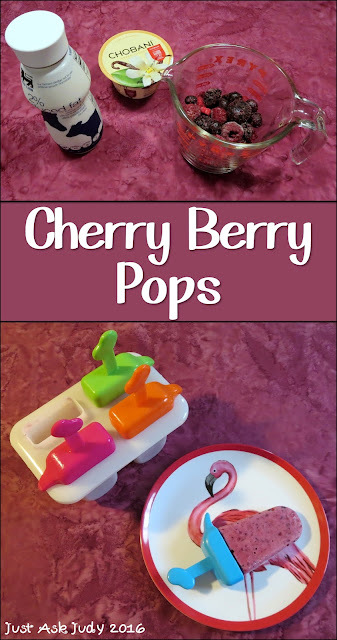 I used a cherry berry mix but peach sounds delicious, too! Measure, beforehand, how much your molds will hold as you might want to double the ingredients. This is a recipe that even preschoolers can help make. Be sure to let the kids do the measuring and pouring. Use words such as measure, ingredients, blend, puree, blender, mold, freeze, and frozen while you are making the popsicles. Talk about each step. While everyone takes delight in their frozen treat, see how many adjectives you can think of to describe it. Follow-up with How to Make Popsicles which includes three different procedural writing pages for telling about the steps. Two pages, with different sized writing lines are open-ended, and one is structured with the topic sentence and sequence/ order words being provided. 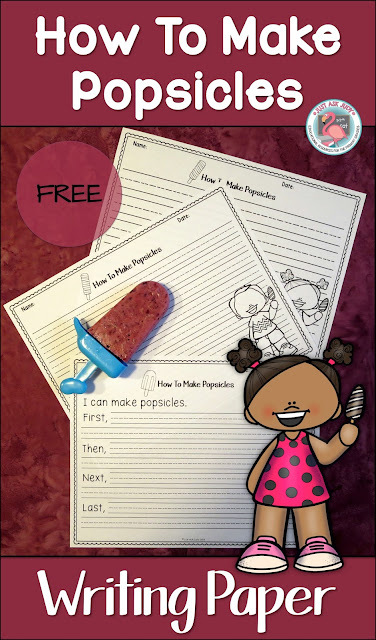 Check out these links for more popsicle themed activities for learning and fun. Popsicle Puzzles, Number Sense 0-20 is available in my TpT store. This post is packed with great fun summer math and literacy resources. Thanks! It’s really “cool” to see so many different activities related to the popsicle.. This was called unit teaching back in the 70s and it makes so much sense to me. You chose a topic and connect every field of learning to it, Reading, Math, Science, Social Studies…. After all, learning is all about connections. Nice job Judy!